Work in my lab includes projects that focus on a variety of organisms and scales from single species population dynamics and habitat suitability analyses to landscape-scale multispecies reserve designs. Many of these studies focus on the biodiversity hotspot of the Oak Openings Region of Northwest Ohio. Undergraduate looking for some research experience? Interested in graduate work in my lab? Where are they? We always examine the spatial constraints of species, ecosystems, and their distributions. We may simply map out where a focal species occurs or use censusing techniques to carefully delineate their habitat or even build habitat models to predict areas of suitable habitat based on critical characteristics. This relies heavily on GIS, remote sensing, and spatial statistics. Are they viable? We also look at factors that affect long-term persistence of species by measuring abundance, survival and dispersal. This may be through mark-recapture studies that directly monitor the populations, indirect methods of estimating survival or activity, evaluation of factors that affect populations and abundance or detailed spatially-explicit population modeling. This relies heavily on basic ecological approaches combined with stochastic modeling. How can we conserve/manage them? All of the projects incorporate some element of management and its impact on the focal species or system. In some cases this is unavoidable since many of the habitats we are studying require active management. We may directly measure the impacts of management actions (e.g., prescribed burning or mowing) on habitat characteristics or demographic rates (e.g., survival, fecundity, abundance) for a species. Our studies usually produce some management recommendations for improving the fate of native species. Kappler, Rachel. 2018. Exploring the population viability of green ash (Fraxinus pennsylvanica) with a stage-based model. Ph.D. Dissertation. Turner, Tyler. 2018. Effects of human land use on the activity, diversity, and distribution of native bats. M.S. Thesis. Gustafson, Greg. 2018. Effects of management practices on terrestrial vertebrate diversity and abundance in an oak savanna ecosystem. M.S. Thesis. Hollen, Jennifer. 2017. Bat diversity, activity, and habitat use in a mixed disturbance landscape. M.S. Thesis. Jonaitis, Lauren. 2017. Using roadkill as a lens to understand animal movement and mortality. M.S. Thesis. Cross, Matthew. 2016. Spatial ecology of Eastern Box Turtles (Terrapene c. carolina) in the Oak Openings Region of northwestern Ohio. Ph.D. Dissertation. Nordal, Christian. 2016. A spatial and temporal analysis of bat activity and diversity within a heavily fragmented landscape. M.S. Thesis. Martin, Amanda. 2015. 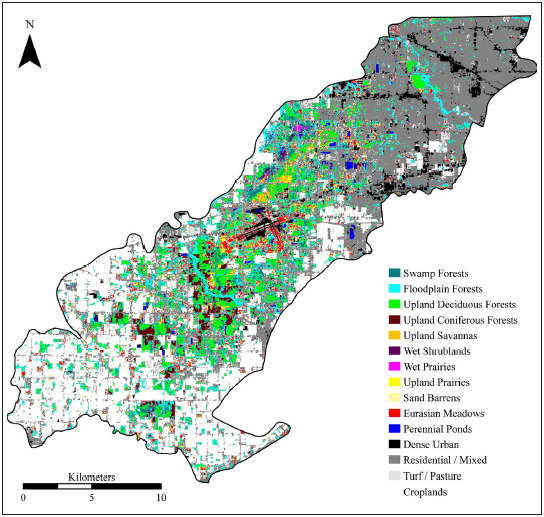 Spatial analysis of amphibians and reptiles in the Oak Openings Preserve. M.S. Thesis. Zaleski, Sara 2015. Environmental influences on avian presence in roadside ditches in an agricultural landscape. M.S. Thesis. Adams, Bryce. 2014. Influences of a human-dominated landscape on midwestern breeding bird occupancy and diversity. M.S. Thesis. Baczynski, Kathleen. 2013. Evaluating Anuran relative abundance and assessing salamander movements in protected areas. Ph.D. Dissertation. Janos, Gregg. 2013. Utilizing acoustic methods to classify bat species, and to assess their habitat use and perception of owls. M.S. Thesis. Sewald, Jessica. 2012. A multidisciplinary approach to bat conservation in the Oak Openings Region of Northwest Ohio. Ph.D. Dissertation. Schetter, Timothy. 2012. A multiscale spatial analysis of Oak Openings plant diversity with implications for conservation and management. Ph.D. Dissertation. Wilson, Steven. 2012. Movement and ecology of the Eastern Box Turtle (Terrapene carolina carolina) in a heterogeneous landscape. M.S. Thesis. Yarrish, Lauren. 2011. Butterfly conservation in oak savanna: Site characterization, nectar resources, and the effects of management. M.S. Thesis. Kappler, Rachel. 2009. Peromyscus population dynamics and seed predation of Lupinus perennis in and near oak savannas of Northwest Ohio. M.S. Thesis. Kuntz, Amanda. 2009. Assessing the effects of White-tailed Deer (Odocoileus virginianus) on the oak savanna. M.S. Thesis. Coulter, Melanie. 2008. A multi-scale characterization of Lark Sparrow habitat and the management implications. M.S. Thesis. Harms, Hillary. 2008. Conservation of the Spotted Turtle (Clemmys guttata): Identifying critical demographic and environmental constraints affecting viability. Ph.D. Dissertation. Barnes, Jami. 2007. An integrative approach to conservation of the Crested Caracara (Caracara cheriway) in Florida: Linking population and habitat modeling for prioritization. Ph.D. Dissertation. Johnston, Christine. 2007. Ecological and behavioral impacts of snag density on cavity-nesting birds in the oak savanna. M.S. Thesis. Pickens, Brad. 2006. The consequences of a management strategy for the endangered Karner blue butterfly. M.S. Thesis. Ricci, Marcus. 2006. Using conservation GIS to build a predictive model for oak savanna ecosystems in Northwest Ohio. M.S. Thesis. Lipps, Gregory. 2005. A framework for predicting the occurrence of rare amphibians: A case study with the green salamander. M.S. Thesis. Martinez-Ortiz, Marina. 2004. Predicting habitat suitability and occurrence for Blanchard's cricket frogs (Acris crepitans blanchardi) in Northwest Ohio. M.S. Thesis.